For control of resistive rated baseboard electric heaters. Extremely sensitive to temperature changes. 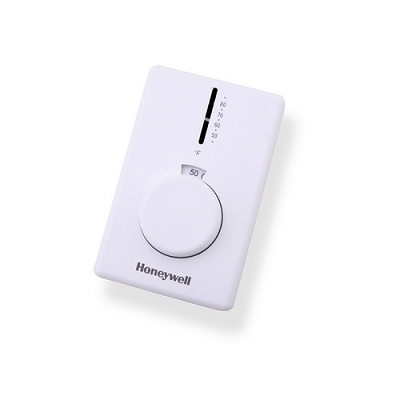 Replace virtually all standard wall mounted line voltage thermostats. Color coded leads allow easy installation. Include long-lasting Micro Switch+ mechanism. Cover thermometer indicates room temperature. Well suited for upgrades and high-end new construction. Mounts directly on vertical 2 x 4 in. outlet box, or on 4 x 4 in. outlet box. Electrical Connections: 6 in. (150 mm) copper leadwires, suitable for connecting to aluminum wiring if approved CO/ALR solderless connectors are used. Electrical Ratings Non-inductive Resistive 22A at 120/208/240 VAC. 19A at 277 Vac.